Ideal for hotel catering or business catering, the Elia Shatterproof Vacuum Jug is clearly labeled hot water to avoid confusion. 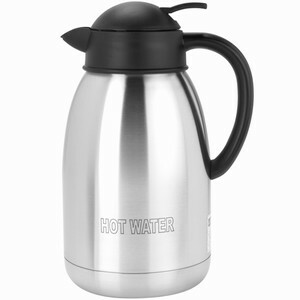 Constructed from high quality stainless steel with a shatterproof double-wall liner, this thermal jug will keep hot water at optimum temperature for up to 12 hours. Please Note: Not dishwasher safe. Replacement lids available upon request from manufacturer. "Nice size & shape and easy to handle and pour."